Shalom Milhama, Where Do My Sympathies Lie? “Israel-Palestine peace,” July 29, 2013. (Wickey-nl – Own work via Wikipedia). Licensed under CC-SA- 3.0 (converted from .svg to .jpg file). As a Hebrew-Israelite between ’81 and ’84, I was taught in temple that we as the members of the Ten Lost Tribes of ancient Israel shared a spiritual and physical bond with the descendants of the tribes of Judah and Levi. As a Hebrew-Israelite, I was also taught that Arab, African and Black Muslims were my spiritual cousins, due respect because of the whole Abraham, Isaac and Ishmael story from the Torah. We, Black Jews, Arab Muslims and European-Jewish-Israelis, were related by blood, history, and Yahweh, and so should support each other. There were to be no contradictions in supporting the right of Israel to exist as a nation-state, this despite the fact that the Arab states of Syria, Egypt, Saudi Arabia and Jordan had fought “to push Israel into the Mediterranean Sea” in 1948, 1956, 1967 and 1973. Israel had a Jehovah-given right to the land between the cedar forests of Lebanon and the Sinai Desert, between the river Jordan and the Mediterranean, at least, that’s what the Torah said. It was a covenant right that couldn’t be undone by anyone or anything except by El Shaddai himself. So naturally, despite my growing knowledge of history, I supported Israel in everything it did in defense of itself. So if Mossad or an Israeli commando unit assassinated a foreign minister, it was fine. When Israel launched an air strike and destroyed an Iraqi nuclear reactor in June ’81, I was all for it. Golda Meir was among my group of female heroes as a preteen and teenager. Somehow in those three years as a Hebrew-Israelite, my political perspective on Israel merged with my religious perspective on Judaism and my understanding of the oppression that Blacks, Africans and Jews have all faced in recent centuries. My understanding of all this, though, began to change even before I converted to Christianity in ’84. It started with an exodus of Ethiopian Jews to Israel in ’84 and ’85, during the government-imposed famine that killed nearly half a million Ethiopians. Unlike the claims of Hebrew-Israelites in the US, the claims of Ethiopian Jews could be clearly traced back to 1000 BCE, the time of King Solomon. Yet for months, Israel held up the immigration process, and then created policies that would make it even more difficult for this groups and the country’s other 120,000 Ethiopian Jews to assimilate. No doubt the fact that it took Israel until ’75 to officially recognize these Ethiopian Jews as Jews has played a role in their somewhat segregated existence in the country. 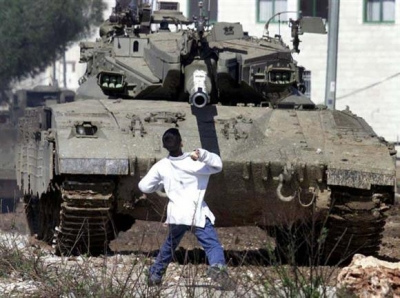 Faris Odeh throws a stone at an Israeli tank near the Israel-Gaza border, October 29, 2000, during the 2nd Palestinian Intifada (ten days before the IDF gunned him down in Gaza). (http://socialistworker.org). Then came the First Palestinian Intifada of ’87 that ran well into the ’90s, when the setting up of Palestinian self-governance zones in Gaza, the West Bank and Jericho gradually began to take shape, leading ultimately to the current state of invasion and chaos between Israel and Gaza. The Intifada began just as I was beginning to understand the full nature of oppression beyond slavery and the Civil Rights Movement. For years, it seemed like I saw the same images of Palestinian youth throwing rocks and marching in the streets while the Israeli Defense Forces responded with tanks, machine guns, tear gas and bulldozers, taking land to build new Israeli settlements in the process. By that point, I’d become interested in South African history, or apartheid in another part of the world. Comparing and contrasting student movements against Jim Crow in the US and against apartheid in South Africa led me to one simple conclusion beyond that undergraduate research paper. That settlement for one group of people was removal, segregation and loss of rights and lands for another group. This was a process that was particularly horrible in South Africa. It led to protests nonviolent and violent, terrorist activities, extreme and ruthless counter-terrorist activities, and international outrage, protests and divestment before the Afrikaner leadership in South Africa finally moved to dismantle their ugly system. It made me realize that what was going on in Israel wasn’t all that different from what had been going on in South Africa for nearly a century. Only, it involved a population of Palestinians only slightly larger that the population of European-born Israeli Jews and their descendants, not a nine-to-one advantage in favor of Black South Africans. Only the form of nationalism in Israel grew out of a mix of Torah-based birthright, European-based ethnocentrism (the first two otherwise known as Zionism) and post-World War I imperialism the British imposed on the crumbling Ottoman Empire, and not out of Boer nationalism and anti-Black African racism. 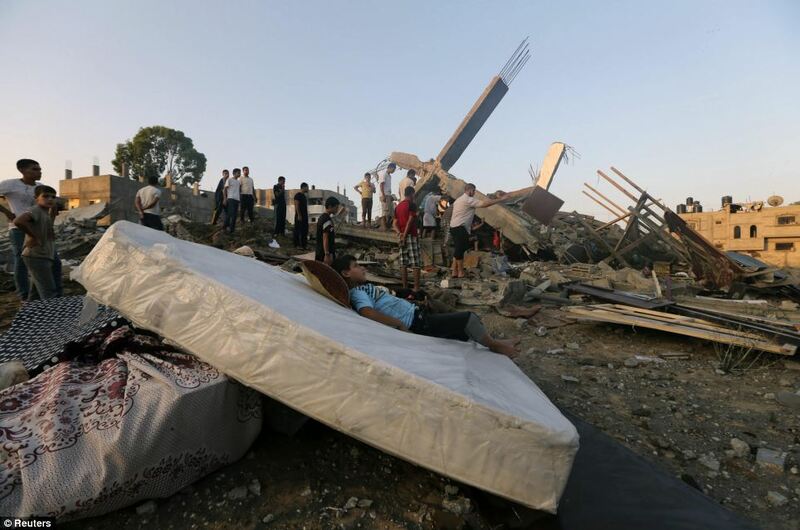 A Palestinian boy rests on a mattress next to the rubble of a house destroyed in an Israeli airstrike, Gaza City, July 9, 2014. (Reuters; http://www.dailymail.co.uk). Aside from these unique features, the theme was the same. A democracy for a select and easily identifiable us (read race and religion here, or at least, skin color and not obviously Muslim). A refugee existence and well-policed apartheid state for those who aren’t us, an assumed group of radical terrorists, even from birth. It’s a bit too late to be on any side that supports the dissolution of Israel as a nation-state. But to support this Israeli government, a right-wing one that responses to any act of violence toward Israelis — whether random or deliberately terrorist in nature — as if Egypt, Jordan and Syria are invading again. It strains my almost boundless imagination. To say that it’s okay to respond to homemade rockets with a military airstrike and ground invasion in an area as densely population as the island of Manhattan is ridiculous. To suggest that the demolition of Gaza isn’t about resources or is a both-sides-are-equally-guilty scenario is to either live in denial or to see Palestinians as less human than Israelis. Last I checked, Hamas doesn’t have an air force or Russian T-72 tanks. So here’s what I see. A one-state solution, forcing Israelis and Palestinians to live together, forcing Israel to end its version of an apartheid system, and forcing both groups regardless of politics to come up with a path to full citizenship rights for Palestinians. Period. The two-state solution is a mirage, and some Israelis seem to only want one state, for Israelis only. Of course, this means that those Palestinians who support an armed struggle will eventually have to follow the path that Nelson Mandela and the ANC and Yasser Arafat and the PLO followed decades ago. Just not today, not while the IDF is destroying a city. At least not until the world and especially the US divests from the state of Israel and embargoes all arms shipments. I wish sometimes that I could go back to that simpler time, when Israel seemed to represent what was right in this world, and the US in supporting them. But I can’t. Those Hebrew-Israelite days were my most oppressed ones as well. This one of the best analyses I’ve read on the situation/blood bath. Thank you!